Starting today, players can join the war effort to combat the large-scale escalation of Axis power as Call of Duty®: WWII – The War Machine is available now, first on PlayStation®4. Packed with new multiplayer content, The War Machine DLC offering is the second expansion pack for Call of Duty: WWII, the No. 1 top-selling console video game of 2017 in North America. With today’s release, players can further the battle as they globetrot across Egypt, France, Germany, and Sicily on three new Multiplayer maps, take on an all-new War Mode multiplayer mission, and survive the undead in the newest Nazi Zombies saga chapter, The Shadowed Throne. Call of Duty: WWII - The War Machine DLC pack is available now, first on PlayStation®4. 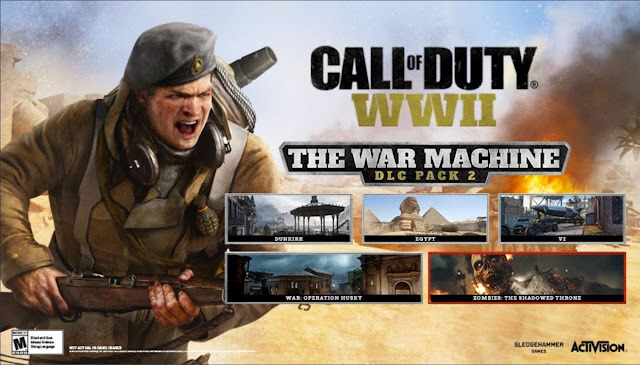 The War Machine DLC Pack is also included in Call of Duty: WWIIDLC Season Pass*, featuring all four DLC Packs planned for the year. Season Pass content is available first on PlayStation®4.